Designed with futuristic elements in mind, Eleaf new Lexicon boasts a gorgeous looking decorated with intersecting lights. Available in various colors and effects, the LEDs will light up in the way you’d like them to be. 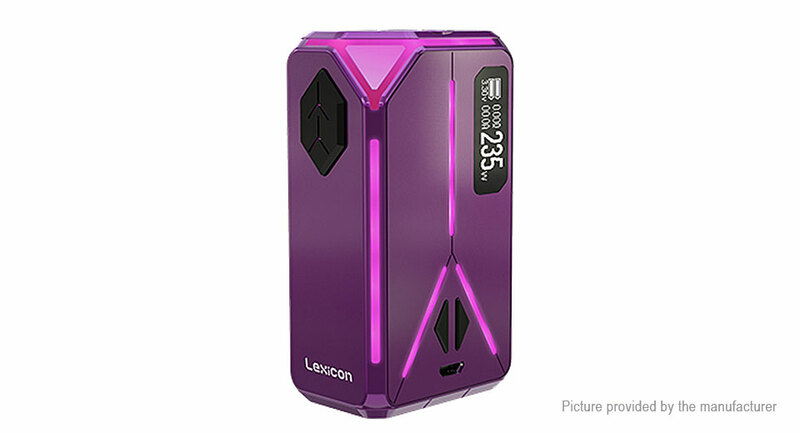 The Lexicon is powered by dual 18650 batteries and can fire up to 235 watts. Additional features including a centered 510, an easy-to-use and upgradeable firmware as well as 0.05ohm support are also a plus. Light show: Available in various colors and effects, the LEDs of Lexicon will light up in the way you’d like them to be. Futuristic and high-tech looking: Designed with futuristic elements in mind, the Lexicon boasts a gorgeous and high-tech looking. Powerful output of 235W: The Lexicon is powered by dual 18650 batteries and can fire up to 235 watts. Support 0.05ohm: The Lexicon supports a minimum resistance of 0.05ohm, capable of even using with RBAs or RDAs. Enjoy vaping with no delay: The firing speed of Lexicon is faster than ever, presenting a pretty much instant vaping experience. Limitless vaping with centered 510: With centered 510 pin, the Lexicon accepts tanks of various diameters. It can handle tanks up to 26mm without any overhang. Circuit protections: The Lexicon is equipped with circuit protections include protections of over-charging, over-current and over-discharging. And reverse polarity protection is achieved by the application of special battery anti reverse circuit on the circuit board. Quick and efficient recharging: With 2A maximum charging current, the battery can be fully recharged much more quickly and efficiently. Charging: the 18650 batteries can be charged in the Lexicon through the front USB port via wall adapter or computer or charged with an external battery charger.